Did you know that you can make glow-in-the-dark chalk? 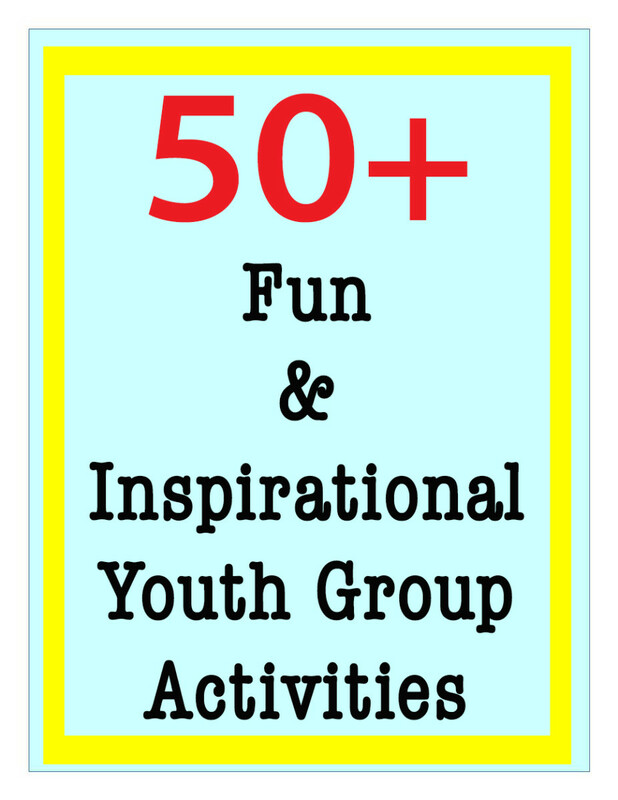 It is a fun nighttime activity that will light up the night and really amaze your kids. And best of all, it is easy to do. 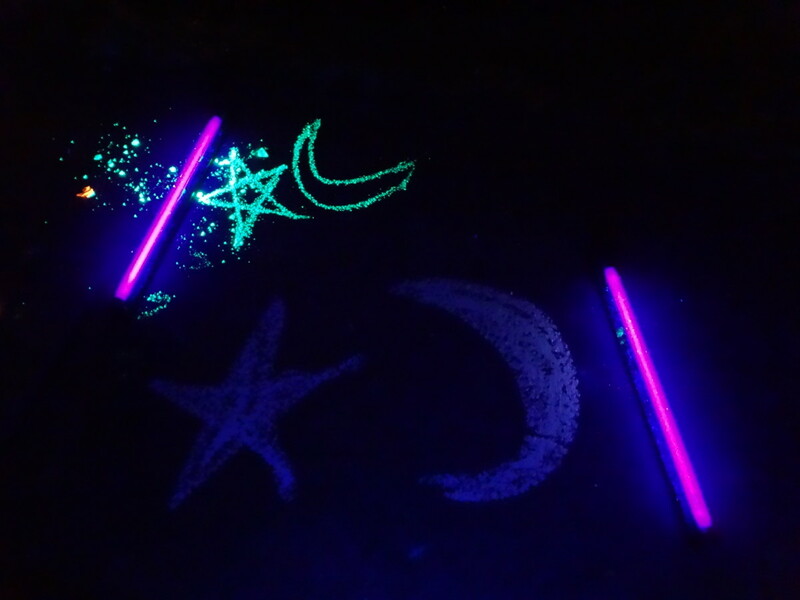 Make creations that glow in the dark by making your own glowing chalk. 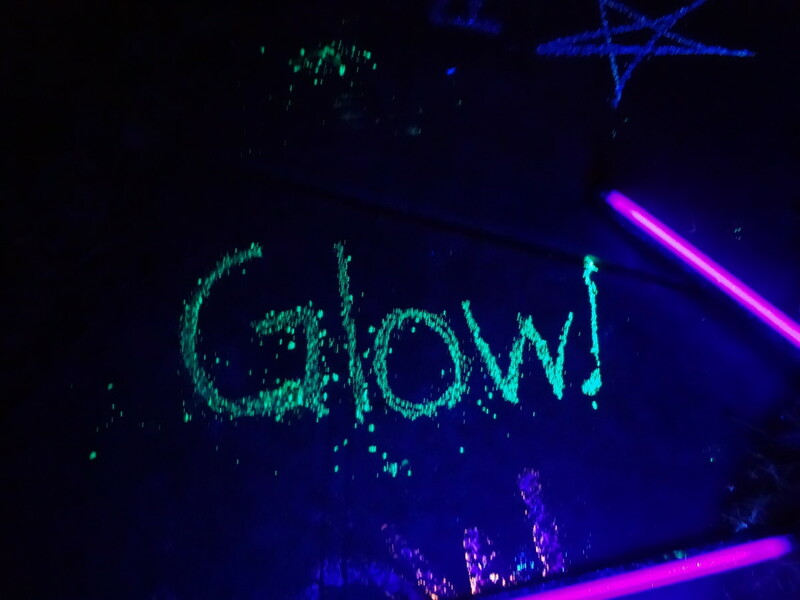 Mix up a batch of homemade glow chalk using a highlighter, glow paint, or even glow powder. Or grab a box of Crayola Glow Chalk for a glowing project to stir together. 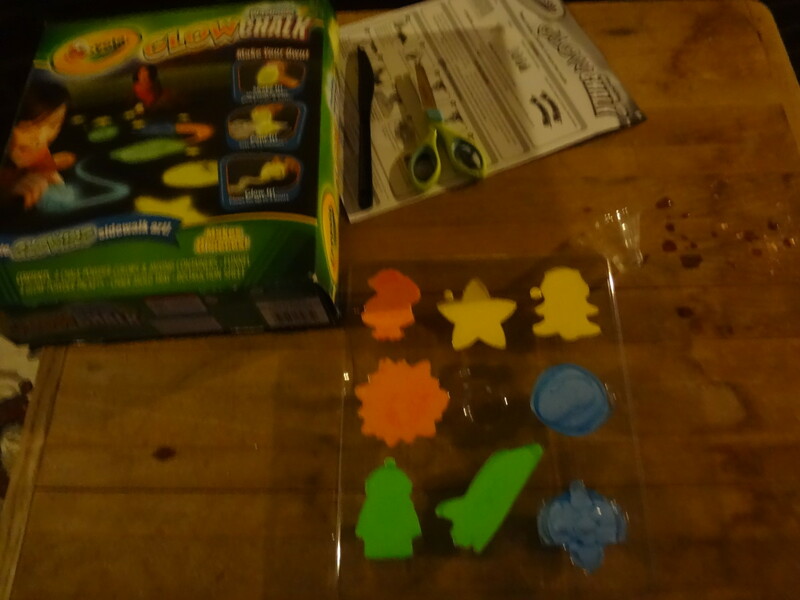 Look below for several methods of making glowing chalk as well as a review of Crayola Glow Chalk kits. Check out how the chalk stands out in the dark. 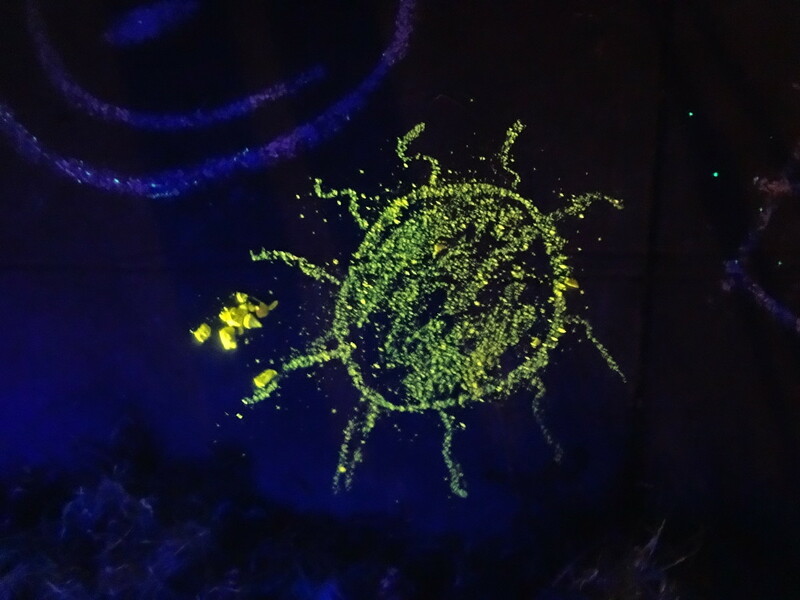 Homemade glowing chalk is not difficult to make and it is really fun to create chalk masterpieces that stand out in the dark and light up the night. HOWEVER, the results will vary depending on which method you use. Sometimes the chalk just doesn't glow right. This is mainly because it is difficult for the chalk to absorb the glow and sometimes the glow source just isn't very bright. Even the Crayola Glow Chalk produces mixed results. But it is definitely a project that is still worth trying, especially if you have a black light. Using a black light will make even regular chalk seem bright in the dark. There are three different glowing materials you can use to create glowing chalk: highlighters, glow paint, and glow powder. 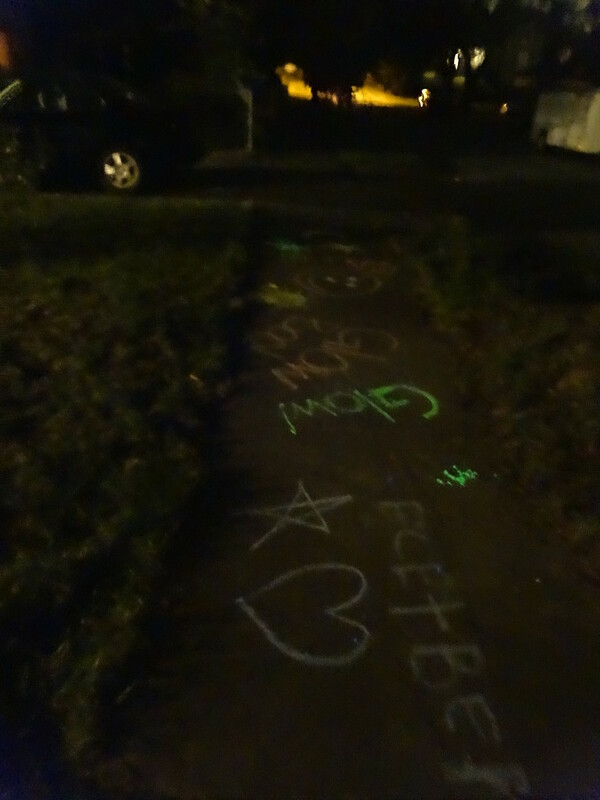 (Glow sticks don't work very well with chalk). You may need a black light to activate the glow. Even if you don't, the black light will enhance the glowing effect. 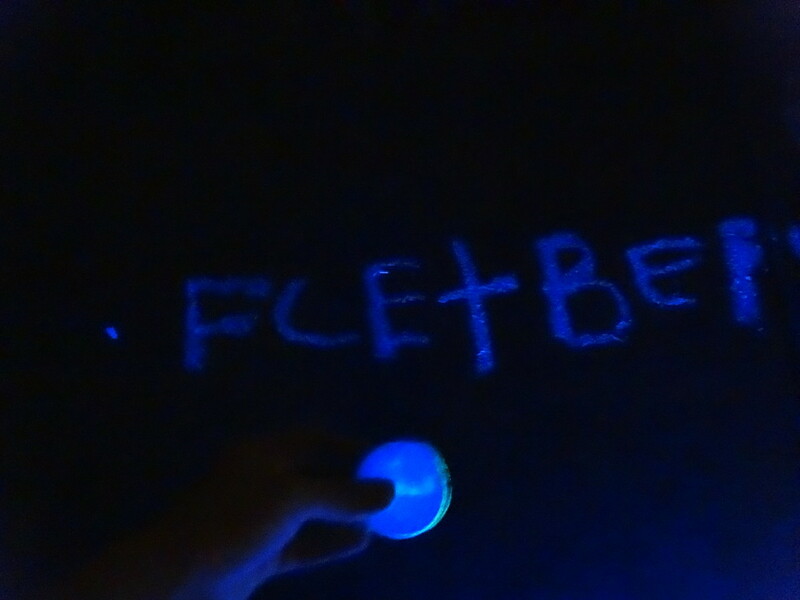 Keep in mind that even if you don't need a black light, the chalk may need to charge in light to glow in the dark. Plan on spending a couple of days making the chalk because it will work better if you let it soak for a few days in the glow water. Try all of the glow chalk methods and experiment to see which method works best for you. The chalk almost seems to sparkle. This is probably the easiest way to make homemade glowing chalk. It is also pretty reliable. 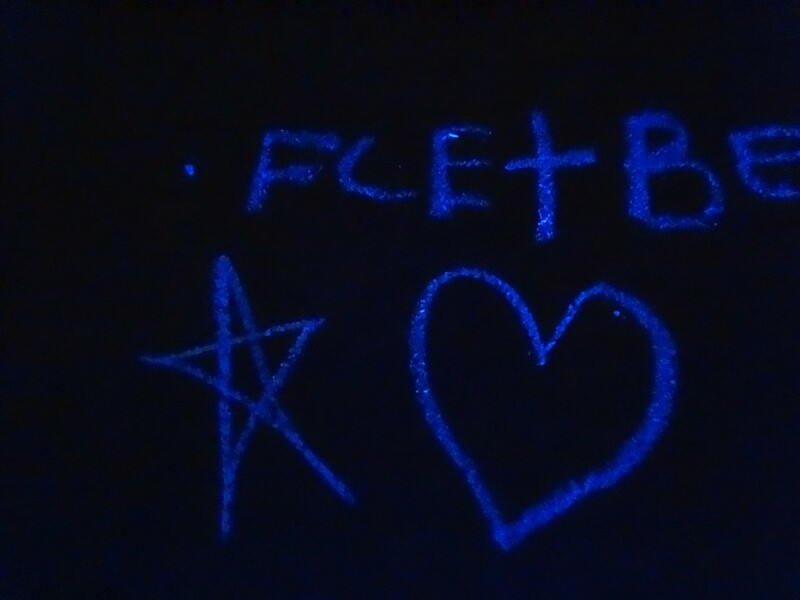 The chalk glows pretty well with a black light. First cut open a highlighter. The type that has liquid usually glows brighter than the types that just have felt. Empty the highlighter liquid into a container or drop in the felt (you may want to use a disposable container in case it stains). Add about a cup of water and let it soak. At this point you may want to check to make sure the highlighter will actually glow in the dark or is black light reactive. Not all highlighters will glow. Some colors glow better than others as well. Green, orange, and dark yellows typically glow the best. Drop a large piece or several small pieces of chalk into the water. 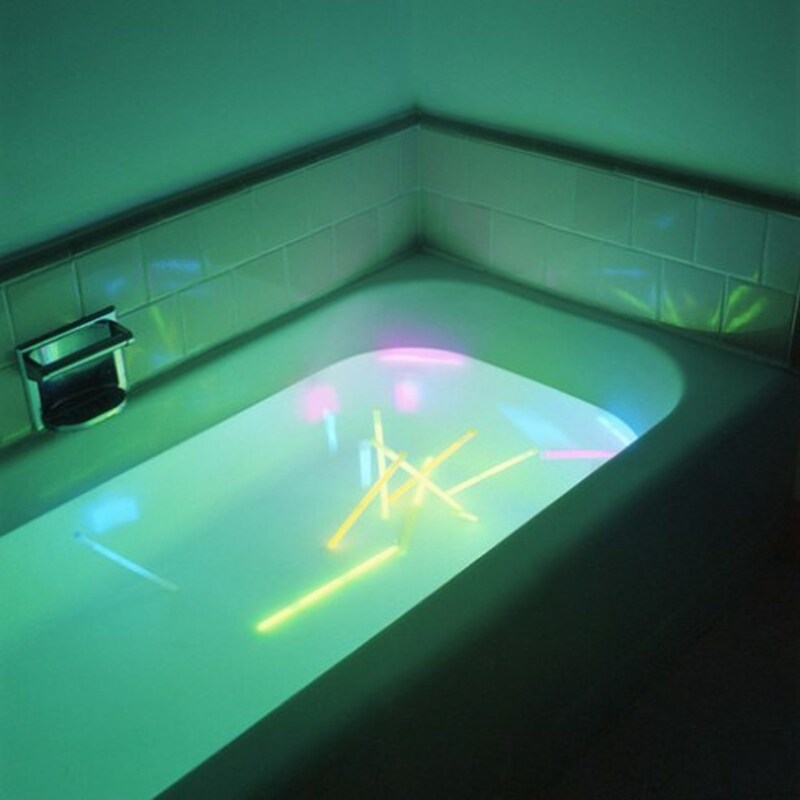 Let the chalk soak in the glow water for 2-3 days so the chalk will absorb the glowing water. Stir the water mix a few times a day to keep the highlighter liquid from settling to the bottom. Remove the chalk from the mixture. Choose a spot to use the chalk. It may be messy and even stain some surfaces and fabrics, so be careful with the chalk and the mixture. Flip on the black light and start your glowing creation! Chalk soaking in glowing water mixtures. 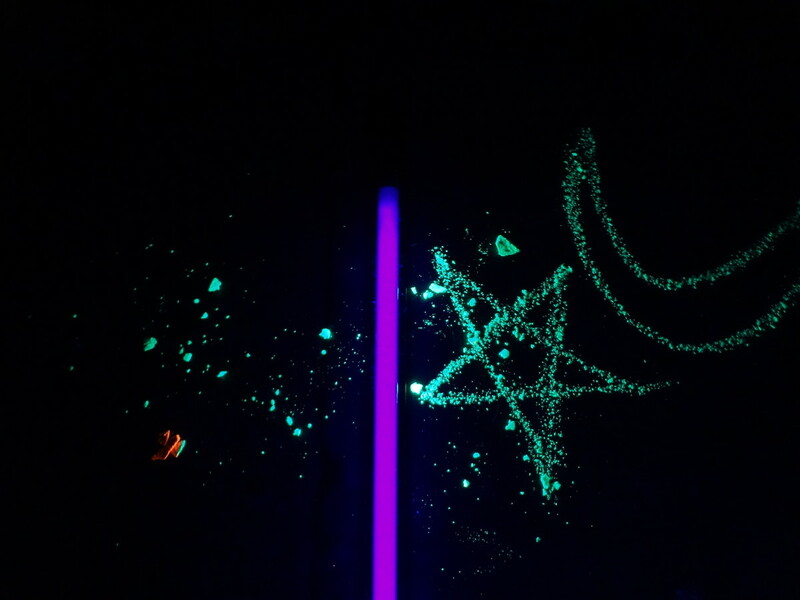 You can also make glowing chalk with glow paint. This method produces varied results, but when it does work, it glows really well. Squirt about 2 tablespoons of glowing paint into a container. The paint may stain the container, so choose a container that is disposable or can be messed up. Add in about a cup or two of water and stir it thoroughly. Add the chalk into the mixture. Let the chalk soak in the water for a couple of days to absorb the glow paint. Be sure to stir the mixture periodically to keep the paint from settling to the bottom. With this method, the chalk will glow better when it has time to dry. So give it a couple of hours to dry before using it. Use the chalk on the sidewalk or somewhere that won't be damaged if it stains. The chalk glows really well when the paint actually attaches to the chalk. If you are using the chalk somewhere that won't be damaged by paint, you can put the paint directly onto the chalk. Squirt some of the glow paint into a paper plate. Roll the chalk around in the paint until it is coated. Allow the paint to dry and harden on the chalk. Then flip on the black light and draw with the chalk. Just make sure you use it somewhere safe. 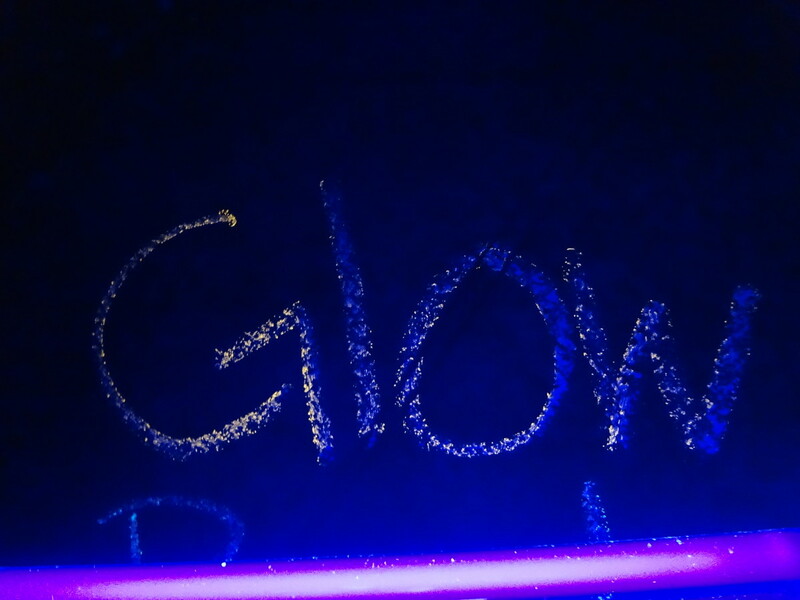 The chalk may leave stains because of the glow paint. Using glow powder to create glowing chalk produces good results as long as the powder itself glows well. 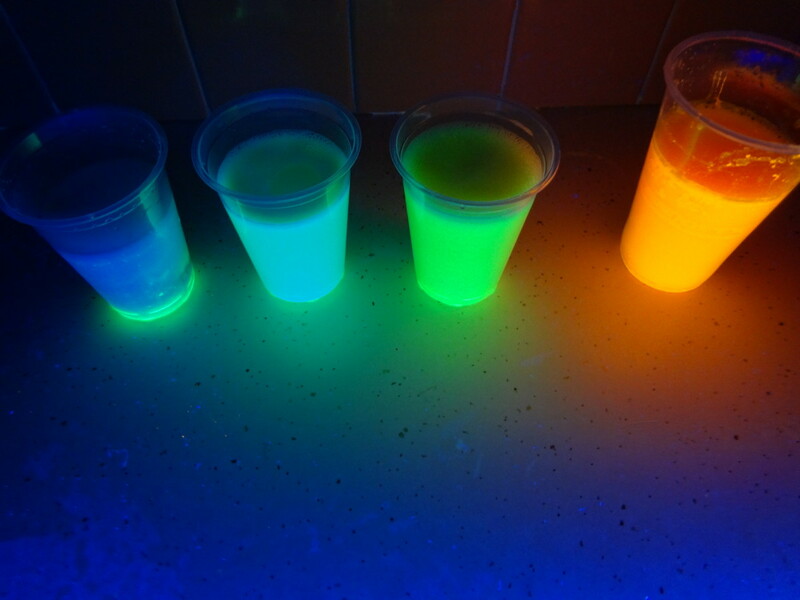 There are a couple of different ways to make glowing chalk with glow powder. Add a spoonful or two of glow pigment to a container. It may stain, so use a container that it won't hurt. Mix in a cupful of water and stir until the powder is thoroughly mixed. Drop a few pieces of chalk into the water. Let the chalk soak in the mixture for a couple of days. Take the chalk out of the mix when you are ready to use it. Flip on the black light and start using the chalk. Make sure you check to see if the chalk will stain before using it somewhere that could be damaged. You can also make homemade chalk and add in glow powder. This is the closest method to the way Crayola glowing chalk is made. Find something to use as a mold. This can be a small Daisy cup or sand toys or any type of container. Depending on how much you make, you may need more than one mold. You will need Plaster of Paris. Mix 1 cup of the plaster with 3/4 cup of water. Mix in 1-2 tablespoons of the glow pigment. You can also add in a spoonful of powdered tempera paint if you want the chalk to be colored. Stir the mix well making sure the glow powder is thoroughly mixed in. 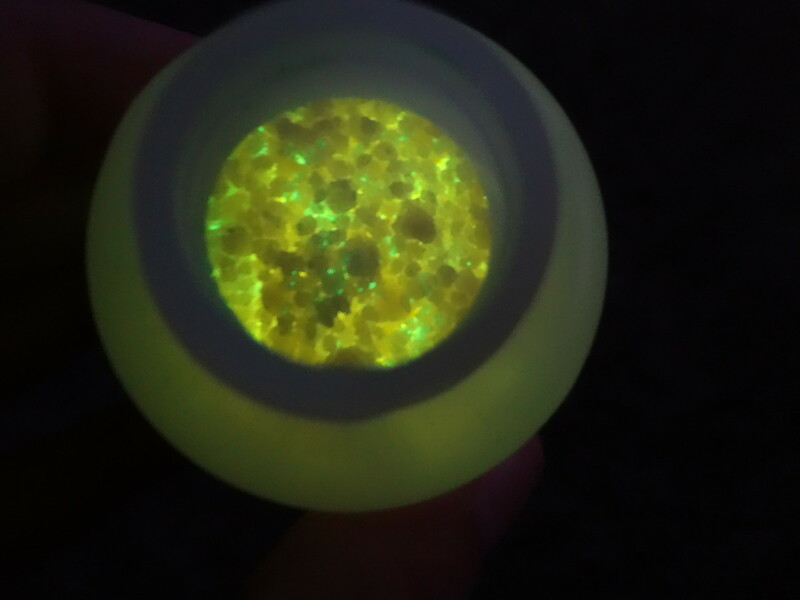 You can test to make sure you have enough glow powder by taking the mix into the dark. Add more glow pigment if necessary. Allow the chalk to harden. Remove the chalk from the mold. Wait for dark and then use your glowing chalk. You may need a black light to enhance the glowing effect. The chalk lit by a black light. The chalk in the molds. 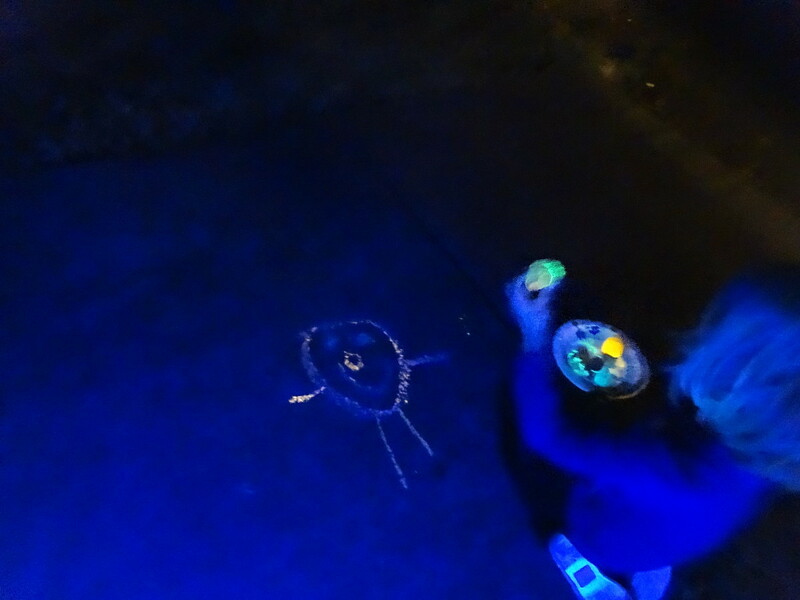 Crayola Glow Chalk can be a cool project to do at night. Most of the colors glow very brightly without a black light. The green and blue chalk does especially. Be sure to follow the directions on the package, though. If the chalk isn't made exactly right, it may not work. You will actually have to make the glow chalk. It isn't something that you can just open and use. It will take about 20 minutes to make and another 30 minutes to an hour or more to dry. And the glow will only last for about 4 hours, so you will need to start making the chalk near the time you plan to use it. There are bottles of chalk powder and you will add glow powder and activator powder to it. Then you will add a bit of water and shake it. I suggest adding the powders to all the bottles and then adding the water. Otherwise the funnel becomes damp and the powder starts sticking to it. When the chalk is mixed, you will pour it into molds and let it dry. The instructions say that it will take 25 minutes for it to dry, but it will really take much longer than that. I found that the chalk that didn't have quite as much water dried quicker and worked better. You add 4 capfuls of water. Try not to use heaping capfuls so the chalk won't be overly damp. The chalk just pops out of the molds when it is dry enough and it is ready to go. What kind of glowing chalk will you make? I am going to make glow chalk with a highlighter. I think I'll try the glow paint for my chalk. The glow powder sounds the best for me. I will just go with the prepackaged Crayola Glow Chalk. I am going to try them all to see which is really the best! Crayola glow chalk on top, homemade on the bottom. Trying to decide if you want to make your own glowing chalk or just grab a box of the Crayola Glow Chalk? There are advantages and disadvantages with each type of chalk. The Crayola glow chalk is typically brighter than homemade. But the glow doesn't last for more than one night. Whereas the homemade usually does. And no black light is necessary with the Crayola chalk. Homemade glow chalk will more than likely need a black light for the glow to work. But the Crayola chalk is very crumbly, especially if it hasn't hardened fully. I had a hard time drawing much because the chalk fell apart. And there isn't much time to let it harden before the glow is gone. 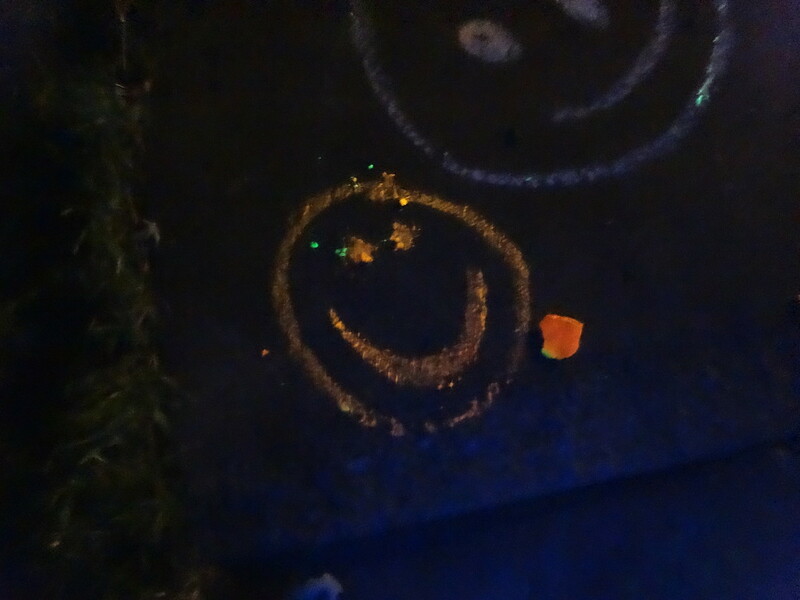 The homemade glow chalk works just like regular chalk. It doesn't crumble when you try to write with it. The expense of each varies. In some stores and at various times of the year, the Crayola Glow Chalk can be expensive. However, sometimes it can be found on sale at a good price. If you use the glow paint or powder, you will have to buy the materials. It will be about $5-10, but it won't take the whole container. So the glow paint or powder can be used again. The effort required to make each kind is probably about equal. There is preparation involved in the Crayola kit as well as the homemade. All in all, if you want the brightest effect, go with the Crayola. 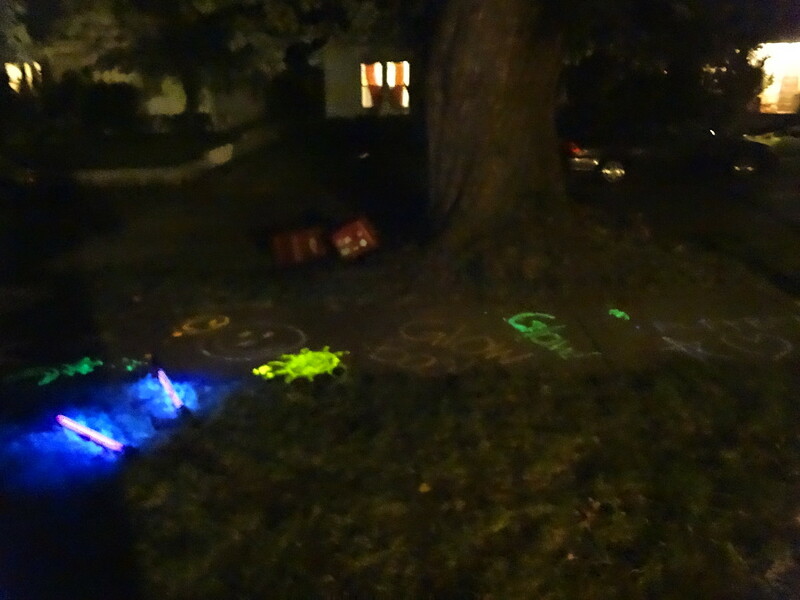 If you want a fun activity that will last for awhile, try the homemade glow chalk. Or give both types a glow and pick your favorite. Mmargie1966 - Thanks so much! Congratulations on becoming a grandmother! There have been some awesome hubs from our team. randomcreative - Thank you! It is a fun project. Nettlemere - Glowing chalk is a great for fall when night falls earlier. FreezeFrame34 - It is a fun idea for Halloween and October nights. Hope the neighborhood enjoys it! Thanks! 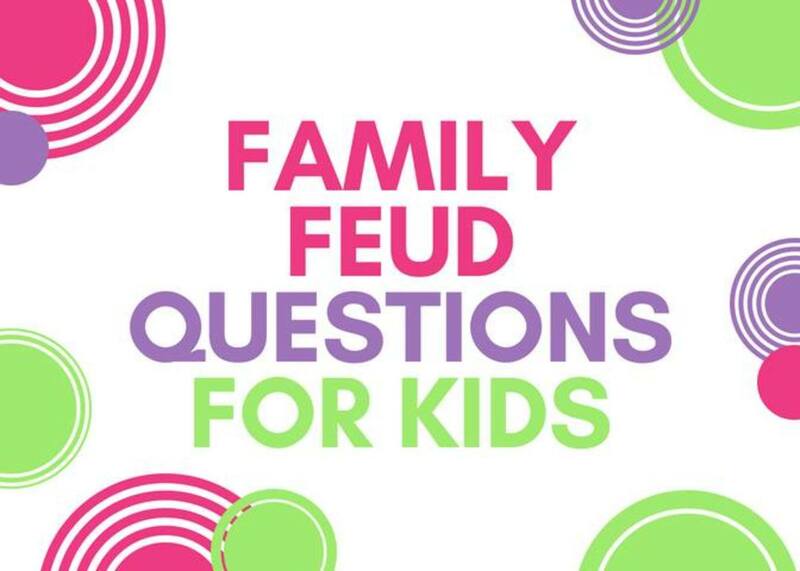 Marcy Goodfleisch - Kids definitely love to experiment. It's fun and a leaning experience. Thank you! This looks like a fun project for kids - they love to experiment and feel like they're chemists! Now I need to round up some spare kiddos and give this a try - glow in the dark chalk should be a hit! Great hub! I will definitely try out all the recipes for glow in the dark chalk very soon! I'm sure all of the neighborhood children will love it as well! Great idea for the Fall and Halloween! What a cool idea especially now the nights are drawing in. How awesome! I definitely want to give this a try sometime. I can't wait to use your brilliant, scientific, fun glow-in-the dark EVERYTHING! Love this! BTW...I'm going to be a grammy soon and don't think for a second that I won't be referencing all your great hubs (among others on the team) to impress my grandchildren!